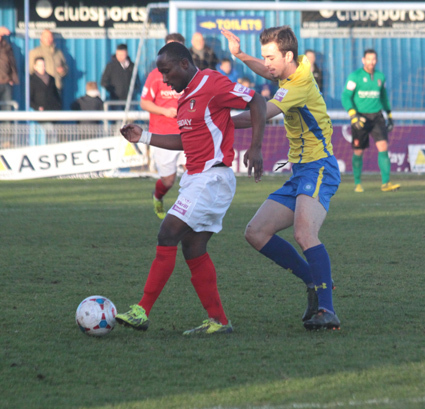 Hayes & Yeading United went down by one goal to three to Concord Rangers on a cold afternoon on a sticky pitch in Essex. The early chances were wayward for both sides, including Gary Ogilvie's low shot wide of the near post for Concord Rangers and Charlie Wassmer's long range effort from Tom Bird's square ball. The first effort on target came from Tony Stokes who got in behind United's defence, latching onto Danny Glozier's long ball but he fired straight into Jamie Young's arms. Soon afterwards, Sam Higgins burst through with a head of steam but Dean Inman recovered with a diving block. Ogilvie had a great chance when he beat the offside trap but in trapping Sam Collins' throughball, it stuck in the turf and he was unable to get his shot away. Concord continued to have the slight upper hand and Collins advanced before laying the ball off to Higgins, Inman denying him with a last ditch challenge which deflected the ball over. 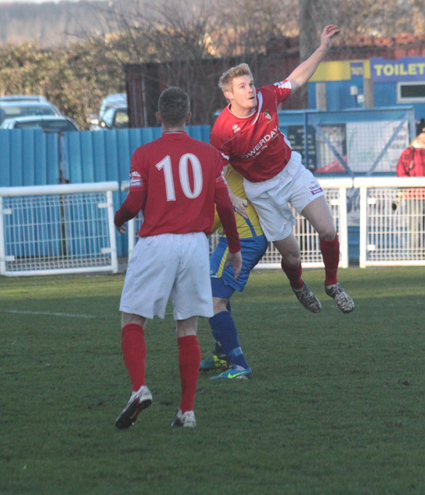 However, Derek Tieku cut inside for United before unleashing a shot which Luke Williams inadvertently blocked. The home side went close again when Higgins collected Jack Lampe's pass and fired an angled shot across the face of goal. Rangers took the lead in the 39th minute. A swift move down the right involving Higgins and Collins caught the United defence out and while Wassmer tried to shepherd the ball back to Young, Stokes nipped in between them and poked it into the bottom corner. United almost responded immediately as Tieku broke down the right channel and Geoff Mitchell was just denied by a brave challenge at his feet from Rangers' keeper Jamie Butler. Phil Babb clearly didn't like the way things were going and acted decisively with a double substitution at half time. One of the replacements almost made an immediate impact as Myles Hippolyte fired just wide of the near post having cut inside his marker. At the other end, Higgins tested Young's reflexes were tested by a powerful near post shot which the United keeper pushed wide. United responded as Hippolyte again got in front of goal following Mitchell's well timed lay off but his shot was deflected wide by Steve King's lunging challenge. In the 62nd minute, a sudden flurry of goals began. Tony Stokes nipped in front of Young to loop a header in from Glozier's deep cross to double Rangers' advantage. However, Williams inspired an instant reply with a forceful run into the area. Tieku took the ball on but Lampe halted his run. 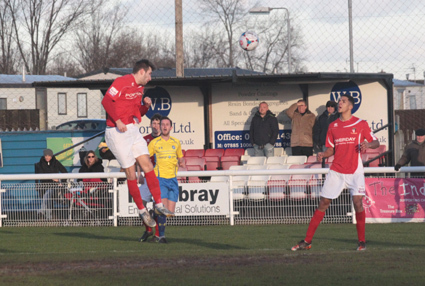 The United striker pressured his clearance which went straight to Mitchell and his left wing cross was deflected off Paul Goodacre's shoulder past his own keeper. However, the chances dried up for a while afterwards, and it wasn't until the 81st minute when the next notable effort came, Mitchell heading inches wide of the far post from Williams' deep free kick. 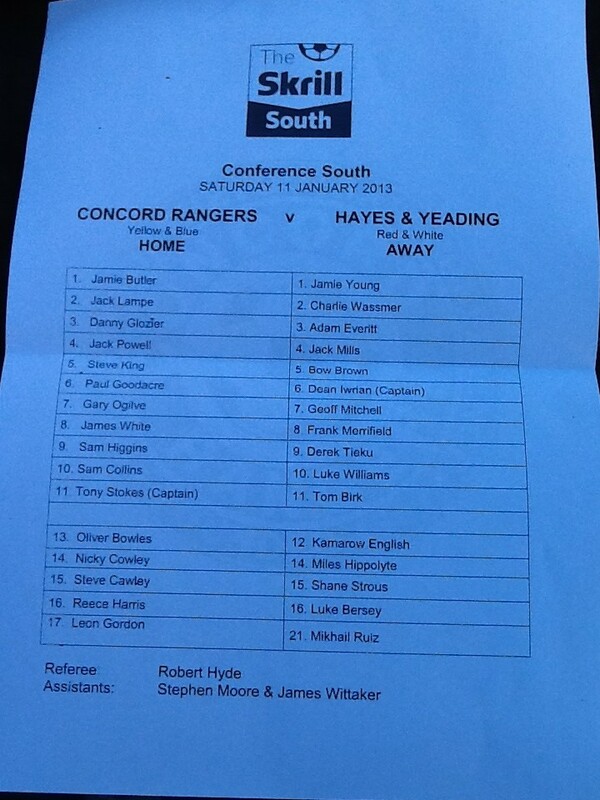 It was Concord's game minutes before the end though, as James White fired in at the far post from Nick Cowley's cross. United Man of the Match: Derek Tieku.